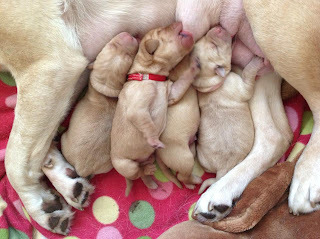 With three litters of puppies to watch on the puppy cam, we’re sure you’re curious about some of their development and some of the milestones they reach. During the first few weeks, the puppies change and grow a lot. By the end of the first week, they will have nearly doubled their birth weight. 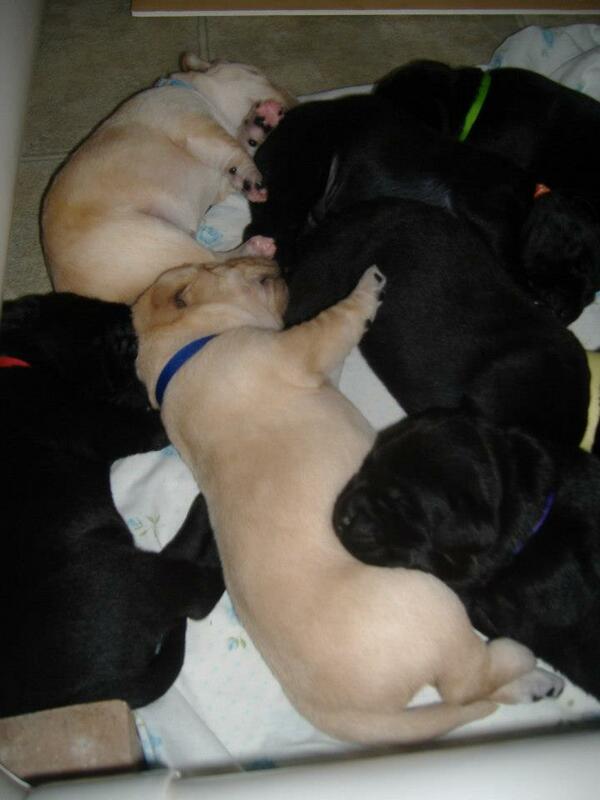 Most of their time is spent sleeping, either huddled with their brothers and sisters, or snuggling with their mom. If you’ve seen the puppy cam, you’ve probably seen the puppies twitching in their sleep. The Ice Cream Puppies snuggle in their sleep. 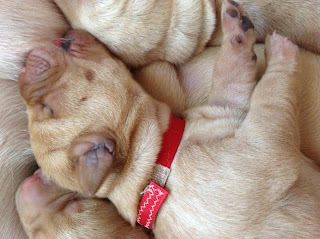 The puppies’ eyes and ears are completely closed, which means they depend on warmth, touch, and smell to find their mom and siblings. 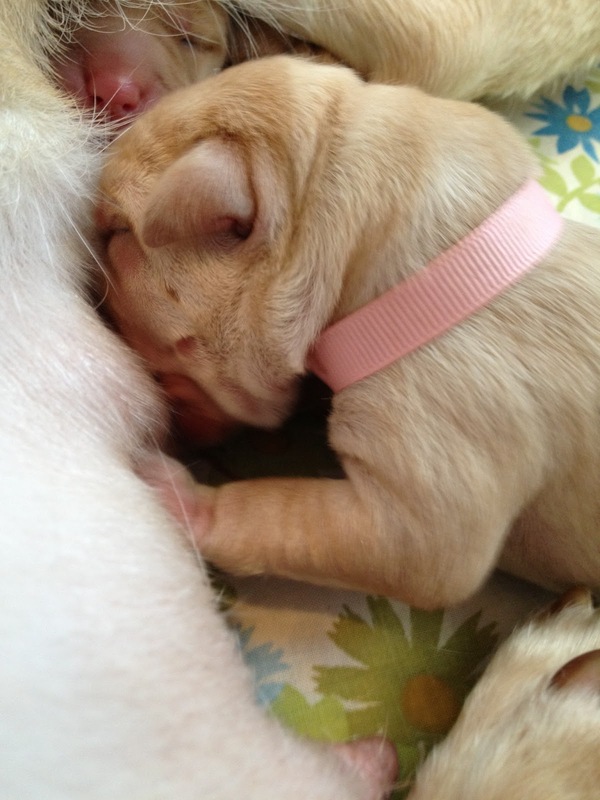 Although the puppies can’t walk yet, they can scoot and slide using most their front legs to propel them. If you watch the puppy cam, you can sometimes see the pups moving their heads back and forth and scooting along, often in response to their mother entering the whelping box. They’re trying to find food or warmth. Bridge's eyes and ears and closed. At this stage, the puppies are unable to regulate their body temperature, so they rely on their mother to keep them warm. We also add heating pads and sometimes heat lamps to the whelping box for those times when the mom isn’t in with her pups. The first 18 days of the puppies’ lives is very important, especially since they’re going to be trained as service dogs. We do something called Early Neurological Stimulation (ENS) with the puppies, which is very mild stress that stimulates brain activity. There have been studies that have found that dogs who experience mild stress during this early development are more adaptable to stress later in life, are more stable, have improved health, have greater resistance to disease, and learn faster, among other things. 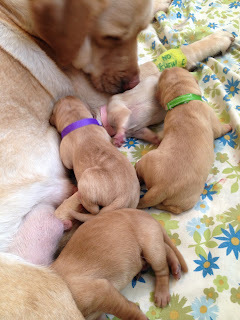 With ENS, less is more, so we perform five activities with the puppies once each day. Each activity only lasts 3-5 seconds. We’ll tell you about week two of the puppies’ development next week. SSD Hamlet is a very mellow puppy. He often begins napping as soon as he wakes up, and sometimes he doesn’t even want to get out of bed in the morning! He usually sleeps on his back, and sometimes wakes himself up from sleep-wagging his tail. Although he loves his naps, he can be quite goofy and energetic when he plays, so much so that he sometimes trips over his own feet! Hamlet is part of the Shakespearean litter, and he’s currently 10 months old. He’s a big, pale yellow lab. His dad, from Guide Dog Foundation for the Blind, weighs about 95 pounds, and at 7 months, Hamlet already weighed 70 pounds, and he’s still growing! When he’s playing, he loves stuffed animals. His puppy raisers gave him one when he was four months old, and he carried it around and chewed on it for weeks without hurting it. Now he has a whole assortment of stuffed animals. Some he plays tug with, some he sleeps with, and some he pulls the stuffing out of when he’s in the mood. Hamlet’s puppy raiser Daisy is a graduate student at Penn State, where she takes classes, teaches classes, and does office work, and Hamlet accompanies her. Because he’s working throughout the day and getting treats, he gets most of his food one kibble at a time rather than eating most of his food at breakfast and dinner. This is a great weight management technique for busy dogs who are getting lots of clicks and treats during the day. 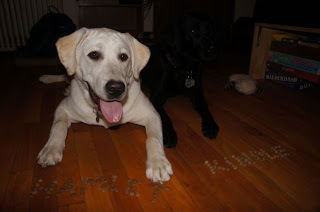 Hamlet typically works for kibble, but when they’re practicing recalls or hiking in the woods, he gets hotdogs, and when they’re working on nail clipping, he gets pieces of cheese. These are his power treats. Hamlet is well-known on the Penn State campus. 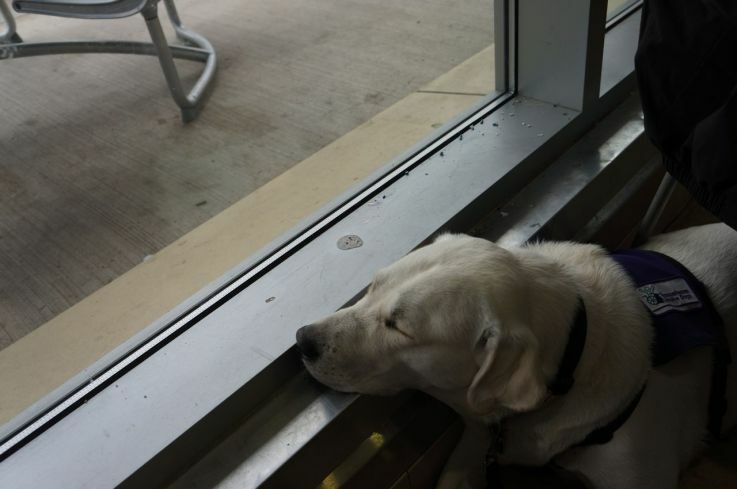 He goes to the libraries and cafeterias on campus nearly every day, where there are often crowds of students cooing at him. He goes to the movies on campus every week, and amazingly, he sleeps through the whole movie, even the loud scenes. In addition, he has gone to an on-campus computer auction, folk dances, and all sorts of restaurants. He even went to a soccer game in the fall, where he watched the ball go back and forth on the field. Over winter break, he went to a video arcade and mini golfing. He’s quite the busy dog! Daisy takes him hiking every chance she gets. Hamlet loves to find the biggest stick he can carry and drag it down the trail. He also loves climbing on things. If there’s a log or a boulder within reach, he’ll hop up and walk along the top. He’s a sweet, fun dog with a laid back personality who’s busy learning to become a service dog. SSD Fire Has His Sneakers Ready. Do You? 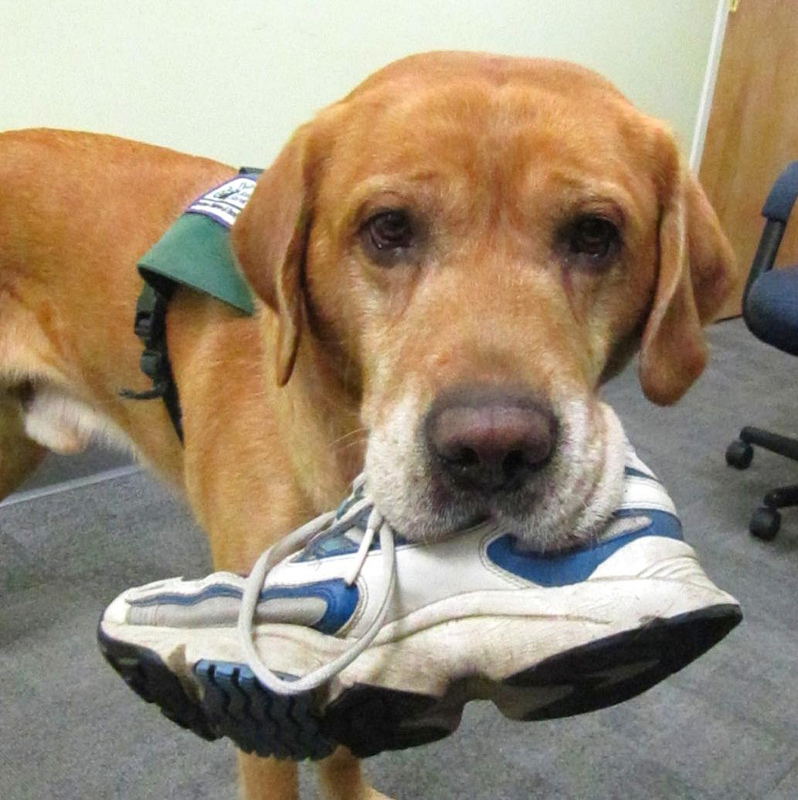 SSD Fire has his sneakers ready for the Highmark Walk for a Healthy Community. Do you have yours ready? Susquehanna Service Dogs is one of 41 organizations participating in the Highmark Walk for a Healthy Community. Lace up your sneakers and join Fire and SSD in the 5K Walk or One Mile Fun Walk at Harrisburg Area Community College on May 18. All of the funds raised for SSD go directly to SSD. There are several ways you can support SSD in the Highmark Walk for a Healthy Community. Sign up for the Highmark Walk, raise money, and walk on May 18, 2013. Can't make it? Be a virtual walker. Our goal is to raise $20,000. Those funds will cover the cost of caring for four litters of puppies for the first nine weeks of their lives. Right now, we have three litters that need your support! 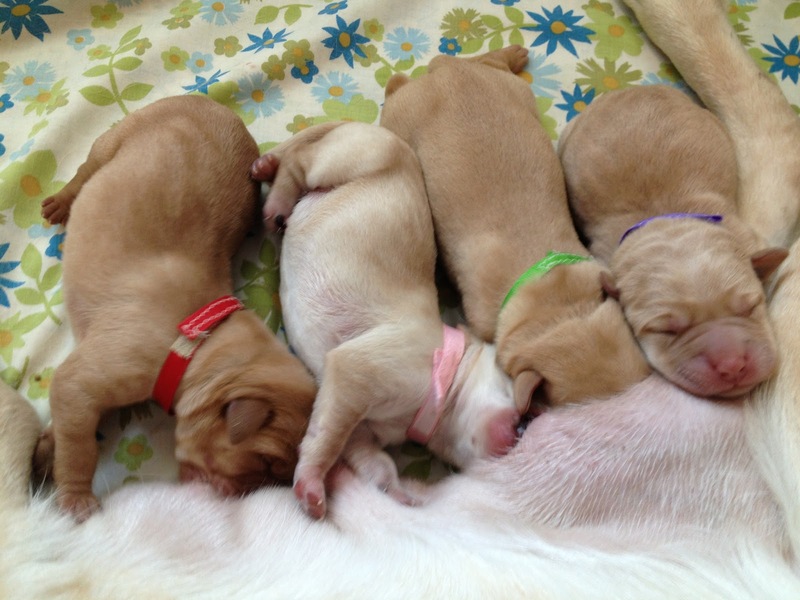 with your help, we can reach 100% of our goal and get these puppies off to a good start. These puppies will become service dogs and change lives. Soon after getting his service dog, one boy slept in his own bed for the first time, with his service dog curled up next to him. "It did not take long to realize what an amazing dog Shamrock is," said the boy's mother. "I have seen so much good from my son and Shamrock being together." Will you join us for the Highmark Walk for a Healthy Community and help us change lives? One Mile Fun Walk: 9:15 a.m. The names of SSD Scotia’s new puppies tell the story of their birth. Our whelping families, the people who take care of the pregnant female and then the puppies for the first nine weeks, usually select the theme. Scotia’s whelpers were having a difficult time agreeing on a theme, but after the delivery, it became clear what the theme should be. 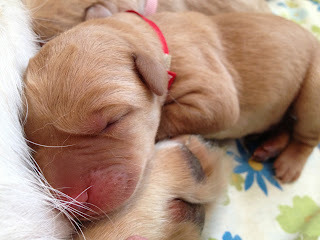 Please welcome the Birthplace Litter! Almost every puppy was born in a different place, so as the theme suggests, they took their names from their birth location. Scotia had been in labor for several hours with no sign of a puppy, so the whelping team and the vet staff on call at Palmyra Animal Clinic decided that Scotia needed to go to the vet for a c-section. In the wee hours of the morning, the whelping team of five people loaded all the necessary supplies for the trip and headed out with Scotia. Something about the car ride must have helped, because at 3:33 a.m., Scotia gave birth in the back of Diane’s (our long-time volunteer and whelping team veteran) car. The first born puppy was a yellow female named Pilot, which is the model of the car. We called the vet to let them know we were taking Scotia back home. With every whelp, we keep detailed notes, and based on Scotia’s past deliveries, we were confident that she should be able to easily give birth to the rest of the puppies. In the past, she tended to give birth every 30 minutes, and she stayed true to form with this litter. 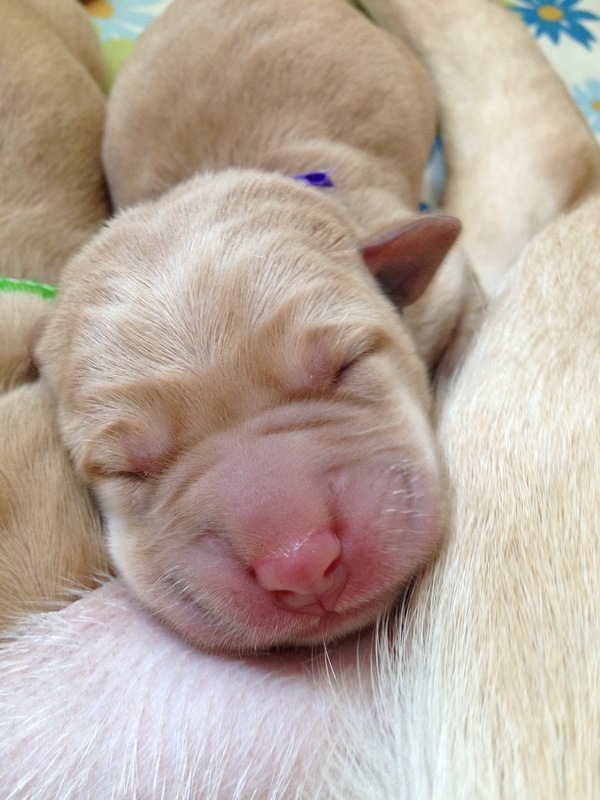 The second pup was born in the car at 3:57 a.m. as they were crossing the George Wade Bridge. This yellow male puppy was named Bridge. Once the whelping team got Scotia, Pilot, and Bridge settled at home, at 4:41 a.m. Scotia gave birth to another puppy, who would turn out to be the only puppy actually born in the whelping box. Her name is Nola, named after the whelpers’ hometown of Enola. Scotia continued in labor for several more hours but made little progress. She was becoming increasingly fatigued, so our whelping team called the vet for guidance, and it was decided that Scotia needed to go to the vet for a c-section. There really was something about the car, because at 7:10 a.m., Scotia gave birth to a yellow female. Sadly, we were unable to revive the puppy, who had gotten stuck in the birth canal. 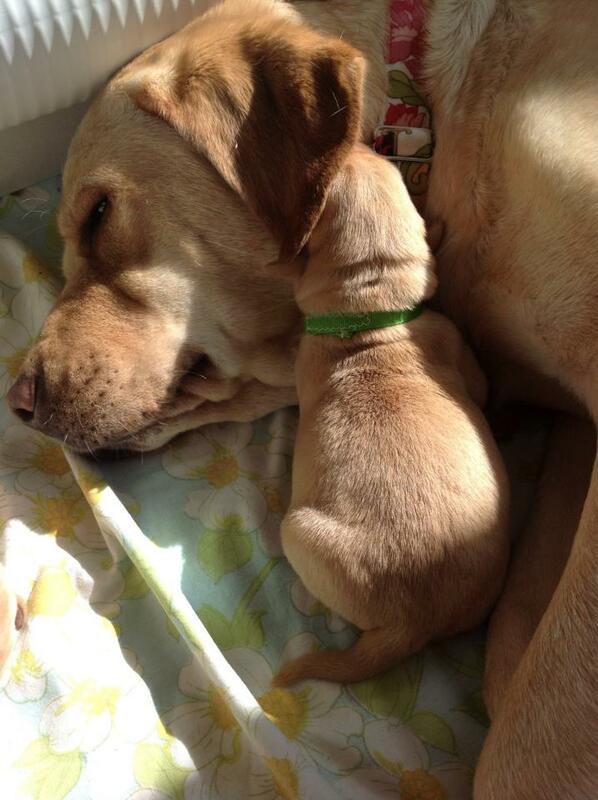 She was named Comfort, because Scotia delivered her in the parking lot of a Comfort Inn. The car continued its journey to the Palmyra Animal Clinic, but at 7:30 a.m., off the Grantville/743 exit of I-81, Scotia gave birth to a healthy yellow male, who was named Grantville. We arrived at the Palmyra Animal Clinic around 8 a.m., and Scotia and all her puppies were escorted back with the vets. She was able to deliver the last two puppies naturally, although both pups were stillborn. Our whelpers decided to name them after the roads our volunteers often travel to get to Palmyra Animal Clinic: Gravel Hill and Cherry, both yellow females. Comfort, Gravel Hill, and Cherry will be buried in a special spot at the home of one of our volunteers. Everyone is doing well since they have returned home. Mom and pups are resting and doing fine. Thank you so much to our whelping team! We’re so glad to have such a wonderful and experienced group of volunteers taking care of the mothers and puppies. At Monticello, SSD Irwin was a great ambassador for SSD and all service dogs. When they arrived at the home of Thomas Jefferson, Donna and Jim expected it to be a little crowded, but they found out that they were visiting during the busiest time of the year. The staff member at admissions had some reservations about Irwin touring the house and grounds. She said that Monticello was not accessible, since it was a restoration of a historical building, and since Irwin was a puppy, there was concern that he would ruin the carpets or other furniture and wouldn’t be quiet during the tour guide’s presentations. She also wasn’t sure if they would be allowed to take the shuttle bus. Their first stop was a 30-minute introductory film. Thinking ahead, Donna and Jim took seats by the exit, in case they needed to leave quickly. The room filled with people. With the shades drawn and lights out, it was almost like being in an actual movie theater, although the seats were simply interlocking folding chairs, which didn’t have space for Irwin to go under. But no matter, he simply settled into a “down” at their feet and slept for the entire film. Although Donna and Jim thought they were sitting near the exit, the group was actually ushered out of the room through a door at the opposite side. Because the rows of seats were close together, Irwin had to walk backwards past 24 chairs before exiting the row. He did great, backing up with a little Irwin hop in his step. Once Donna and Jim were seated, Irwin put his head in Donna’s lap and stayed that way for the entire 15 minute trip. They were part of a group of about 60 adults, teens, and young children. Irwin seemed most comfortable either in the “heel” position or standing right in front of Donna. Despite the admissions person’s trepidations, Irwin was still and quiet while the tour guide spoke, even when children were eating and drinking around them. He didn’t get distracted—just stayed focused on Donna and seemed content. Inside house, the guides pulled Donna and Jim aside just to make sure that Irwin wasn’t going to disturb anything. Irwin quickly surprised everyone with his good behavior, especially because absolutely no food, including dog food, was allowed in the building. Irwin was working “for free.” The larger group was divided into smaller groups of 12, and Irwin walked nicely on a loose leash through the tour. It didn’t matter if he was at the front, middle, or back of the group. He did the same thing—loose leash walking until they got to a room, then sat and settled into a “down” while the guide was talking. The whole time, Donna only used hand cues. After a while, Irwin figured out the routine and automatically did it. He even started dozing a few times! By the end of the tour, the people who had been with them from the beginning were full of questions about Irwin, his training, and how Donna and Jim were going to give him up some day. It was quite a successful day! Irwin even got the chance for some relaxing sniffing time, and he climbed a giant tree! In Virginia, they stayed at a campsite that had a beaver dam on a pond, and the trees around the site were all chewed by the beavers. When Irwin saw one of the beavers, he stood alert, but he didn’t bark or try to chase it. The beaver slapped its tail on the water in warning and dove into its house. During their trip, they also visited the Walton Mountain Museum, where they watched the film and viewed the displays—and by now, Irwin knew exactly what he was supposed to do. Later, Donna, Jim, and Irwin spent two hours hiking. All in all, it was a great trip and Irwin had many successful, positive experiences. Look for more about Irwin as he continues his journey to becoming a service dog.